In anticipation of our Alberta Collective Agreement coming due, our members asked us to adopt a deliberate and considered approach to negotiations. An element of that has been to carefully monitor the labour relations landscape in the retail food industry. The Saskatchewan and Manitoba Safeway agreements are part of that landscape. Examining those agreements, we can anticipate some of the issues that will come into play when we are called upon to make decisions involving Alberta bargaining. We again remind ourselves, however, that our Alberta union members want and need their own deal. Alberta is a large market for Sobeys. Saskatchewan has a dozen stores, and Manitoba has 23 stores. In Alberta, there are 75 stores – that’s more than double the number of stores in those two provinces combined! There are also over 100 Sobeys stores in Alberta, where the same products are sold as in Safeway stores. Our members’ jobs and hours are being bled out at their workplaces into non-union Sobeys stores where wages and benefits are much lower. This problem needs to be solved. 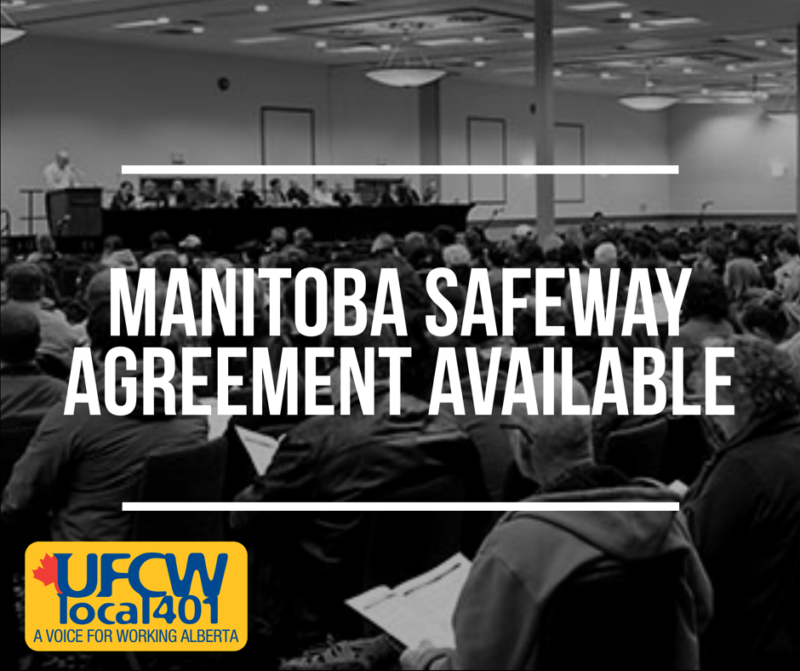 In our view, Manitoba and Saskatchewan cannot be seen as precedents for the economic expectations of Alberta Safeway union members. Alberta has long been a higher wage economy. Retail sales in Alberta are enjoying a sustained period of gains. The minimum wage in Manitoba is currently $11.15 per hour; it is currently $10.96 per hour in Saskatchewan. Alberta will soon have a $15.00 per hour minimum wage, pushing all Alberta workers’ starting wage expectations almost 40% higher than those in Saskatchewan and Manitoba. As a final note, and notwithstanding the viewpoints expressed about Alberta, we must congratulate the spirited union members from UFCW Local 832 in Manitoba. They were faced with horrific company proposals that would have truly gutted their Collective Agreement. Manitoba Safeway union members’ 98% strike vote demonstrated a level of solidarity that rattled Sobeys such that most of the company’s proposed takeaways did not make their way into the final agreement.